The rich tradition and fine craftsmanship of Irish jewelry are well established. Artisan jewelry makers in Ireland have been designing and hand crafting exquisite, distinctively Irish jewelry pieces for many centuries. Celtic culture in Ireland has been dated to the 8th century BC during the iron age and precious metalwork and jewelry have been a tradition ever since. Today famous Irish jewelry makers such as Solvar, Boru, Jean Butler Jewellery, and ShanOre Jewelry are known for their beautiful traditional and modern treatments of the many classic Irish motifs. The variety and range of Irish jewelry options available today is vast and the quality and craftsmanship are superb. At IrishShop we've painstakingly assembled our Irish jewelry collections to include what we feel are some of the finest examples of men's and ladies rings, wedding rings and wedding bands, engagement rings, earrings, necklaces, pendants, charms and charm bracelets, bangles, brooches, pins, watches and cufflinks. Below are links to the main jewelry category pages for these Irish jewelry lines. 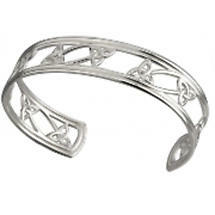 Within many of the categories you'll find links to subcategories and special collections such as our Irish Jewelry lines for religious occasions, Celtic jewelry, our History of Ireland Jewelry collection, our Mo Anam Cara "My Soul Mate" collection, as well as collections of fine jewelry by specific Irish jewelers such as Solvar and Jean Butler. From popular Irish Gaelic phrases to Trinity Knots and beautifully inlaid shamrocks to majestic Celtic crosses to myriad jewelry designs featuring the famous Irish Claddagh, jewelry from Ireland is instantly recognizable for its unique visual motifs. Among the most recognizable, Claddagh "faith rings", according to how they are worn, express one's current relationship status. Claddagh jewelry in Ireland was traditionally passed from mother to first daughter and worn to symbolize friendship or as a wedding ring. Though of earlier origin, the Claddagh symbol takes its name from the ancient Irish fishing village of Claddagh just outside Galway City on west of Ireland where it has long been featured in jewelry design. Jewelry bearing the phrase "Mo Anam Cara" ("my soul mate" in Irish) or "Gra Go Deo" (Irish for "Love Forever") can proclaim a heartfelt bound between lovers or close friends. Sacred symbols such as the Trinity knot and the cross, whether rendered in pure gold or sterling silver or adorned with diamonds or other jewels, can serve as religious symbols and markers of important religious occasions or simply as beautiful historical or secular jewelry design motifs. Irish jewelry bearing shamrocks or leprechauns is worn as a proud statement of Irish heritage or just to proclaim and inspire Irish spirit on St. Patrick's Day or on any other day that calls for a bit of Irish. Exquisitely Irish wedding rings and bands in every style and price range. To complement our other Irish jewelry collections, we've hand selected a beautiful line of Irish wedding rings and bands and engagement rings. Uniquely Irish jewelry crafted in 14k white and yellow gold and in sterling silver, many with diamonds and other precious stones. IrishShop wedding jewelry lines include distinctly Irish ring designs featuring the "Mo Anam Cara" (My Soul Mate) inscription, "Gra Go Deo" (Irish for Love Forever), Claddagh variations, and a range of other traditional and modern Irish jewelry styles and motifs. Each wedding ring is made in Ireland and hallmarked in the Assay Office in Dublin, certifying the jewelry's authenticity and quality. IrishShop's jewelry collections employ a range of precious metals, many with brilliant gemstones set in the bands or addorning a Claddagh. Other pieces feature single or strung pearls. Many of our rings, wedding rings, wedding bands, earrings, necklaces, bracelets, pins, watches, and cufflinks are are produced in 14k gold, white gold, yellow gold, sterling silver, stainless steel, platinum and bronze. Several rings feature beautiful blends of these materials, often highlighting a Mo Anam Cara inscription or an elegant Claddagh. Jewelry gemstone settings include diamond, emerald, sapphire, jasper, marcasite, amethyst and zirconia. Several fine jewelry pieces are set with stunning freshwater pearls. We also offer Claddagh rings and necklaces in all birthstone gems. At IrishShop we take great pride in authentic Irish craftsmanship. 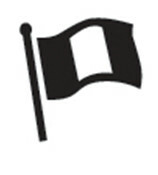 We are a Dublin, Ireland based company in operation since 1997 with a presence also in the USA. We source jewelry products from all over Ireland and from renowned Irish jewelry designers and makers including Solvar, Boru, Jean Butler Jewellery, ShanOre Jewelry and others. All of our Made in Ireland jewelry is hallmarked in the Assay Office in Dublin, Ireland, an official certification of its authenticity and quality. 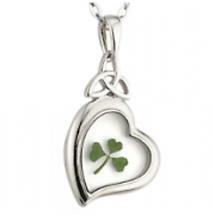 Special occasions, religious or secular, are made even more special with a jewelry gift that celebrates Irish lineage. 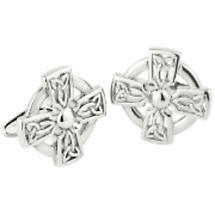 For that first communion, a ring, bracelet, pendant or earrings featuring the Trinity knot or a Celtic cross. For St. Patrick's Day, a beautifully inlaid sterling silver shamrock pendant or earrings, or perhaps an Irish Penny watch. Spread Christmas cheer with Trinity Knot snowflake, snowman or candy cane bracelet beads in sterling silver. Irish jewelry for Valentine's Day is a perfect fit. The famous Claddagh, a heart clasped by two hands, can be worn as an elegant ring, necklace, pendant, earrings, brooch or pin for her, or as a attractive Claddagh ring, watch or cufflinks for him. Irish jewelry also presents many gift options for Mother's Day and Father's Day. Perhaps the most famous among Irish / Gaelic language expressions featured as jewelry motifs, "Mo Anam Cara" (My Soul Mate) and is a favorite inscription for the bands of Irish rings, wedding rings, pendants and bracelets. The Irish expression "Gra Go Deo" (Love Forever) and the variation "Gra Anois Agus Go Deo" (Love Now and Forever) are also beautifully rendered on our gold and silver bracelets and rings. The phrases "Le Cheile" (Together) and "Dha Chroi Le Cheile" (Two Hearts Together) are typically accompanied on jewelry by the Irish Claddagh, two hands clasping a heart, ancient symbol of faith and trust. Family crests and coat of arms have historically been important symbols in Ireland, linking the wearer to centuries of Irish family and clan history. Today these historic symbols can be displayed in beautiful Irish jewelry personalized with your family name and the appropriate historical crest. These authentically personalized rings, pendants, cufflinks and watches make unique gifts for others or for yourself. The History of Ireland Jewelry Collection is a hand-crafted range of elegant jewelry that portrays the history of Ireland in a series of historical panels evocative of the panels on the Celtic High Crosses which were such a distinctive expression of Irish Christian Art up to medieval times. Produced by the Irish Jewelry house Solvar, the collection features distinctive sterling silver and 14k gold rings, a sterling silver Celtic cross pendant, hand-crafted men's and ladies sterling silver bracelets and a sterling silver ingot pendant, all bearing a series of ancient Irish symbols. A completely unique jewelry collection that could only come from Ireland.